Laparoscopy generally requires between 2-4 small ‘keyhole’ incision on the abdomen (tummy). Through these small holes, instruments such as a laparoscope ( thin telescope-like instrument), scissors and grasper are introduced to perform the surgery. 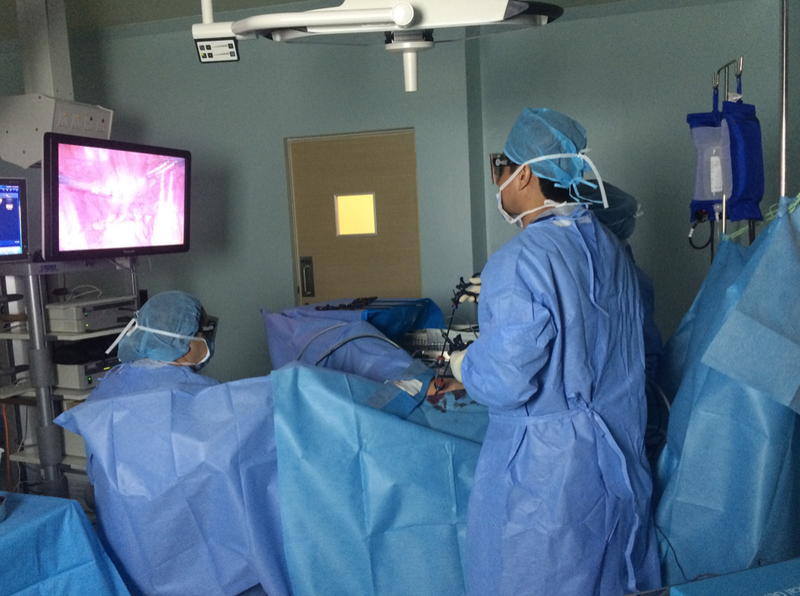 Latest development is 3D Laparoscopic surgery, where the surgery is done with 3D screen. Currently , most of the gynaecological surgeries can be done laparoscopically. Even some gynaecological cancer surgeries are done this way. You may be wondering how laparoscopic surgery can achieve ‘small holes, nearly painless and out -of-hospital the next day’ ? You are not the only one asking this question and this is not the only question asked. 1. How will my surgical wound looks like ? Your abdomen / tummy will usually have between 2 to 4 small cuts. The cuts are normally no larger than 1cm, typically in between 0.5 to 1cm. The wound normally heals very well and the scars not very visible in majority of cases. 2. Is there any way to do surgery with smaller scar on my tummy? Fortunately for you, YES , there is a way. It’s called Single Incision Laparoscopic Surgery, where only ONE cut about 2cm is made at the umbilicus. Once it heals, you don’t even see the scar as it is within your belly button. However, it is not suitable for all types of surgery . 3. How a surgery can be done through a small hole ? Are you kidding me? I am not a magician.. I use thin, small instruments to do the surgery. The laparoscope helps me to see the internal organs in a magnified view which is projected on a TV screen. The latest technology is a 3D screen which improves the clarity of image. The surgery is performed by utilising very specialised laparoscopic instruments. 4. Why less pain in laparoscopy? In traditional surgery ( laparotomy) , big skin incisions are made in order to gain access to internal organs. On the contrary,in laparoscopy only tiny punctures are made. Thus, post surgical pain as a result of wound healing is more severe in traditional surgery than in laparoscopy. In the majority, mild pain relief is sufficient. 5. How early can I walk after the surgery? On the same day if possible! Because there is less post surgical pain, you can already walk after you do not feel dizzy due to the effects of anaesthetic medications. The next day, you back on your feet and getting ready to go home. 6. “Out of hospital the next day” , is this possible ? Definitely a big YES, but it depends on the type of surgery done. It is even possible to go home the next day after a major surgery such as hysterectomy. This can be achieved because of quicker return of bowel function and very little pain after surgery. For certain type of surgery, the patient can go home on the same day after the surgery! Generally, 1 night stay after surgery can be expected. 7. How will I know if laparoscopy or conventional surgery is better for me? Laparoscopy surgery can reduce the chances of adhesion (scar tissues inside abdomen) formation. In laparoscopy, only fine instruments are used to perform the surgery, whereas in traditional surgery, the surgeon places his / her whole hand inside the abdomen. Therefore, traditional surgery has a higher likelihood of adhesion formation. This is especially important if you want to conceive because adhesion in the area of Fallopian tubes and ovaries may lead to difficulties conceiving. Method of surgery is also dependent on the underlying condition that are being treated. Most of gynaecological surgeries can be performed laparoscopically. 8. Is laparoscopy surgery safe? Any surgery, however small it is, has its risks. In laparoscopy, the magnified vision helps the surgeon to see the internal organs better. This can lead to reduced bleeding. Moreover, infection risk can be reduced because the internal organs are not exposed to the room air. Expert use of the surgical tools may lead to a better surgical outcome. In short, the skill of the laparoscopic surgeon can determine the outcome of the surgery. Quicker return of mobility also reduces the risk of deep vein thrombosis (DVT) , which is formation of blood clot in your blood vessels due to prolonged immobility. I hope by now you have a better understanding about laparoscopic surgery. I hope you could appreciate the benefits that it offer you. God forbid , if you need a gynaecological surgery in future, ask your gynaecologist about laparoscopic surgery. Don’t get a big scar for no reason and don’t make me say “ I told you so..”. Hi Mr Ravi, can I have your email address please? I’ll email you . Generally, fertility treatment can be used to have a child in cases ED . Thanks.